The highly anticipated "Mambacurial" Kobe 8 hits stores tomorrow. Inspired by Kobe Bryant's love of soccer, this Nike Kobe 8 System MC draws its inspiration from the Nike Mercurial Vapor IX football boot. Coming in a red plum, electric green and pink flash colorway. They feature a plum based upper that fades to pink from front to back. A black midsole, sockliner and laces along with hits of electric green found on the logo on the tongue, Swoosh and outsole. Look out for these at select Nike accounts worldwide as a limited release on Friday, June 7th, 2013. Retail is set at, $140. 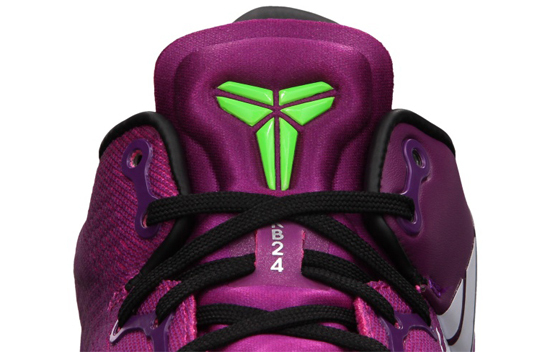 Enjoy the official images of the "Mambacurial" Nike Kobe 8 System MC in red plum, electric green and pink flash below. If you're looking to pick these up when they release, check in with your local spots to see if they will be receiving them. Those of you looking for a pair now can, click here to grab them on eBay.